Ga Kho Gung is a dish that brings a lot of laughs to my family. My mom goes to work really early in the morning and she usually wake up extra early to prepare lunch in advance for my the rest of the family. On occasion when she doesn't get the chance to cook in the morning my dad becomes the cook for that day. Even though my dad has great taste in food, he cannot cook. Whenever I come home after school and see fried eggs and boiled green beans on the dining room table, I know my dad made lunch that day. Sometimes it's edible, other times it's not. My dad likes to flavor his cooking with only one ingredients, salt. My mom and I always have a good laugh anytime my dad cooks. One afternoon I came home from school to a huge pot of ga kho gung. It was incredibly good! When my mom came home from work I complimented her pot of ga kho gung. She, however, did not make the ga kho that day. We both thought for sure it cannot be my dad, but who else could it be? The next day, I praised my dad on his ga kho. It made him really happy to hear that both my mom and I love his ga kho. When I came home after school that day, my dad had made another pot of ga kho. Again it was delicious. The next day I told him again he did a great job on this chicken. After school of that day, again there was another pot of ga kho. My dad made ga kho FIVE days in a row! Even my brothers, who never really have much to say about food were getting tired of chicken. That weekend we had an emergency family meeting with my dad. No more ga kho please! My dad learned a valuable lesson that day, less is more. Recently, my sister-in-law reported that my dad had pulled another ga kho week at home. It made me laugh but that's my dad! 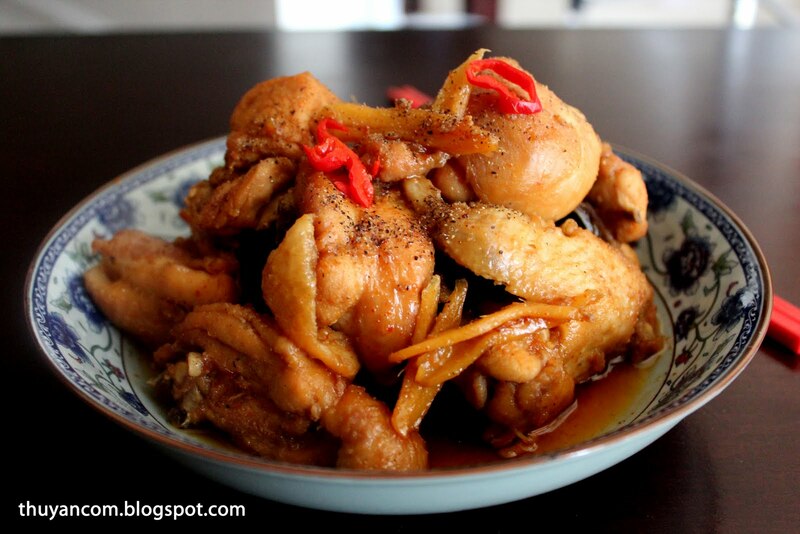 The process to make Ga Kho Gung is very similar to Thit Heo Kho. You basically braise the chicken in the same caramel sauce and then add ginger. The ginger turn the caramel sauce into a totally different flavor. This is a great recipe if you like spicy food, adding chilli powder to the chicken elevate the flavor even more. 1. Wash the chicken thoroughly or you can even par boil it. If parboil drain and rinse. 2. Marinade the chicken with the minced shallot, julienned ginger, 4 tablespoon of fish sauce, 1/2 tablespoon of salt, 1/2 tablespoon of mushroom seasoning, 3 tablespoon of sugar, 2 tablespoon of vegetable oil, and crushed chili to liking . Let chicken marinade for an hour or so. 3. Heat up a pot on medium heat. Add the marinated chicken and start cooking on medium heat. Turn meat as needed to brown the surface. 4. In a small sauce pan, caramelized 1 tablespoon of sugar. When the sugar turn dark brown add 1 tablespoon of water and stir together to become a liquid. Add liquid to the pot of chicken. Make sure every pieces of the chicken is coated with the sauce. The caramel sauce should give the chicken some color. 5. Add enough liquid to the pot (2 cups of water or chicken broth) to braise the chicken (enough liquid to barely cover the chicken). 6. Cook on medium heat until the liquid is reduce and chicken is tender ( about an hour). 7. Once the cooking process is done, top some black pepper on top. 8. Serve with white rice and enjoy! this is my fave ! and it tastes almost as good ad my dads! and I've been following your blog for a while! nothing like some homemade Vietnamese cooking ! what a funny story!! hehe Im making this tonite and it's very similar to how I make it too except i use lemon grass. I just made this. It's soooo yummy! Thank you so much for posting. Your blog is my go to Vietnamese recipes.